The new diagnostic assay format could provide a means of performing low-cost tests for particular strains of flu at the point of care, but there are challenges to address. The flu season is up and running in the Northern Hemisphere, and early signs in both the United States and Europe are that the effects might not be quite as severe as the brutal 2017/18 season. The United States is predominantly seeing H1N1 circulating, while monitoring in Europe has identified co-circulation of H1N1 and H3N2—both varieties of Influenza A that should be covered by the seasonable vaccine. What if they weren’t though? Influenza A can be found in both human and animal populations, and it evolves rapidly through genetic mutation. Each year many humans rely on their country’s vaccination program, which is based on scientists’ best guesses as to the likely flu strains the population might encounter that winter. But vaccinations might not protect patients against a new and unexpected strain. Should one emerge, the race will be on to identify the strain, where it has come from, whether it has been seen before, and whether it can be contained. A new diagnostic assay format, CRISPR diagnostics, might provide a means of performing low-cost tests for particular strains of flu at the point of care. In this article, we consider the outstanding challenges that academics and industry must address before the test format could replace conventional nucleic acid testing and other test methods involved in containment of pandemics. It is widely recognized that while contracting flu can result in a few days of uncomfortable illness for an otherwise healthy adult, it can have far more significant and sometimes fatal consequences for patients in high-risk demographics (e.g., elderly, immunosuppressed patients, etc). Efforts continue to inform the public about the risks of flu and the simple ways in which individuals and organizations can reduce the chance of spreading the virus. Globally, it is thought that seasonal flu infects up to ~1 billion people every year, and so there’s a reasonable chance that all of us will come into contact with the virus in the next 12 months. Heading into this year’s flu season, we are told that the UK is better prepared than ever before. A new “adjuvanted” vaccine is available for patients over 65, and the quadrivalent vaccine (including two A strains, H1N1pdm09 and H3N2 and two B strains, Yamagata and Victoria lineage) will be available in injectable form, while younger children will continue to have an intranasal quadrivalent vaccine available. A survey commissioned by Well Pharmacy in October highlighted a combination of both apathy towards and scepticism about the vaccine, however. Of the >2,000 adults surveyed in the UK, ~70% of respondents had experienced the flu in the past, but more than half of all respondents said they did not plan to get the vaccine this year. Around one in five of the respondents said that they believe they can catch the flu from the vaccine—this is impossible as the flu vaccine does not contain live virus. The provision of public health information and education undoubtedly plays a role in warding off flu each year, but the seasonal flu vaccination is the only tool widely available to prevent the illness spreading. Unfortunately, it does nothing if anything other than the strains contained within the vaccine comes into play. Several “universal” vaccines are in development whereby the patient’s immune system is exposed to a part of the virus that is thought to be common amongst virus strains. For example, Thompson et al2 have identified an epitope of limited variability in the H1 hemagglutinin protein—this means there is a part of the H1 protein that is largely similar among different H1 variants that the immune system could potentially recognize and react to. Pre-clinical studies showed that mice vaccinated with this epitope were able to induce immunity to human H1N1 strains that have been in circulation since the “Spanish Flu” of 1918, now widely believed to have caused >100 million deaths. Clinical development of this and other universal vaccination approaches will continue, though economics mean that it is unlikely many big pharma companies will become involved—the need to deliver financial gains to shareholders mean R&D efforts are more likely to be focused on drugs that can be used on an ongoing basis for chronic disease management rather than a once-only vaccination. In addition, drug development is a slow and tortuous process, so there’s certainly no guarantee a new vaccine will be ready in time for the next pandemic. Dan Jernigan, director of the Influenza Division at the CDC’s National Center for Immunization and Respiratory Diseases, believes that H7N9 or “Asian Avian Flu,” a particularly virulent strain of Influenza found in China in recent years, is the most likely candidate to cause the next pandemic. First reported in March 2013, the virus strain was typically found in those working in close proximity to poultry. From serology tests conducted between 2011 and 2013, there is very little natural immunity (0-7%) in the Chinese population, and so perhaps it is no surprise that the mortality rate is high: 38% of cases reported to date. It should be noted that an aggressive campaign to vaccinate billions of chickens began in September 2017, and the number of reported human cases recorded in the 2017/18 season fell dramatically. However, new H7N9 and H7N2 strains have since been found in China’s duck population, so it isn’t yet clear if the vaccination program has been a great success story or whether it has helped to drive further genetic mutation in the virus. As yet, this strain hasn’t evolved to a position where H7N9 can be passed from human to human, so a pandemic has been avoided. Admittedly, research published last year showed that the virus is only three mutations away from being able to transfer directly from human to human. 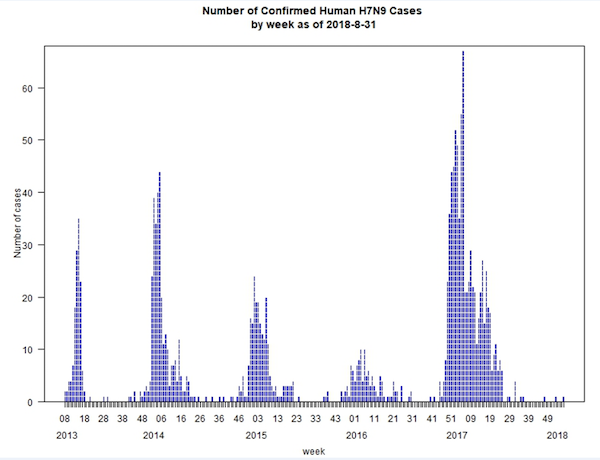 Given the H7N9 mortality rates reported to date, that’s a scary prospect, and there’s every reason to fear a pandemic of equivalently deadly proportions to those which have occurred before. Whether monitoring seasonal flu or trying to control a pandemic, accurate tests are a key part of an epidemiologist’s toolkit. Rapid point-of-are tests for flu in the form of immunoassays have been available for years. While relatively low cost and easy to use, they have tended to lack sufficient sensitivity for effective population health management. In recent years, three of the four major providers of central lab diagnostics have each invested in CLIA-waived molecular diagnostic systems for use at the point-of-care. Abbott has renamed the Alere i system it inherited as part of last year’s acquisition as the ID NOW, Danaher offers Cepheid’s GeneXPert, and Roche’s Cobas LIAT system came about through its acquisition of IQUUM. It doesn’t take much creativity to imagine that Siemens Healthineers will follow in due course. These leading nucleic acid systems are no doubt useful tools in directing appropriate treatment and reducing overall treatment costs. A study published in November predicted how the Roche Cobas LIAT system could save the NHS £24m per year. However, while the Roche, Cepheid, and Abbott systems can differentiate between Flu A and Flu B, none of them is able to identify sub-strains in that same rapid test format and so cannot easily provide the information needed to guide treatment, surveillance, and bio-containment efforts during the next pandemic. Anyone with an interest in biotechnology or life sciences should be aware of the acronym “CRISPR.” The role of CRISPR-Cas9 in gene editing in applications as diverse as fetal medicine, biodefense, and synthetic food makes for a stream of high-profile news. In 2018, several articles were published on the use of CRISPR in diagnostic tests for early-stage cancer detection or infectious diseases. In these tests, enzymes are being used to directly detect viruses found in clinical samples. For example, Gootenberg et al published results from their SHERLOCK platform, which uses the Cas13 enzyme, while Jennifer Doudna’s UCal lab in Berkeley CA, employs Chen et al’s DETECTR platform using Cas12a. Both tests use guide RNA to find a complementary sequence in the sample, followed by cleavage of a reporter probe. These probes then generate a fluorescent signal for measurement by various methods. Test formats can vary from “one-pot” assays conducted in a single tube measured by a colorimeter to lateral flow formats. To be useful in the context of pandemic surveillance, it is crucial that diagnostic tests can accurately differentiate between strains. Myhrvold et al4 report on work using the SHERLOCK assay platform to identify accurately various strains of the Zika virus as well as detect single nucleotide polymorphisms in that same virus. While admittedly nucleic acid testing can claim that same attribute, the applicability of CRISPR diagnostics to sub-strain identification of Influenza seems obvious. Furthermore, the speed of individual assay development (<1 week reported by Myhrvold et al to design and test assays for the six most commonly observed drug resistance mutations in HIV reverse transcriptase) suggests that this technology could be used effectively in rapid diagnostics for pandemic control. The ability to multiplex these CRISPR-Cas tests will also be paramount in realizing clinically useful tests, whether monitoring pandemics or in general use. Gootenberg et al’s5 updated SHERLOCKv2 demonstrates some early promise here, reporting 4-channel multiplexing using a combination of Cas13a and Cas13b enzymes. This might be sufficient when a known strain is being pursued. However, a 4-Plex test won’t be enough to cover every known Influenza strain circulating in animals and humans today; even further multiplexing will be required to include pathogens such as RSV in a point-of-care test. For reference, while not differentiating between them all, specificity data for the Roche Cobas LIAT system were evaluated using 28 strains of Influenza A, 15 strains of Influenza B, and 7 strains of RSV. Spatial separation, as typically seen in arrays, could be used successfully. It’s no surprise that the academic promise of CRISPR diagnostics is being translated into commercial efforts. Mammoth Biosciences, co-founded by Doudna and a number of upcoming biotech stars from Stanford and UCal, came out of stealth mode in April 2018. CEO Trevor Martin described the promise he saw of CRISPR diagnostics: “Imagine a world where you could test for the flu right from your living room and determine the exact strain you've been infected with, or rapidly screen for the early warning signs of cancer,” Engadget reported. A few months later, Mammoth’s $23m Series A raise was announced in the middle of this year’s AACC meeting, the annual conference attended by all the world’s movers and shakers from the IVD industry. Mammoth claims to be using both Cas 12 and Cas 13 to detect RNA and DNA respectively and appear to be developing a diagnostic platform suited to identifying the presence of any specific genetic sequence. While grand promises from Californian IVD start-ups have been met with increased scepticism in the last couple of years, there is genuine excitement around the potential of CRISPR diagnostics underpinned by solid academic research. However, given some of the fierce litigation around the use of CRISPR for gene editing, it’s hard to imagine there won’t be the occasional skirmish for Martin and his team on the road ahead. Although the sensitivity and specificity reported for these test platforms appears comparable with nucleic acid testing achieved through PCR, the tests are not quite ready to go to market as yet. Indeed, whether the sensitivity and specificity levels published to date can really be maintained in tests produced in volume, dealing with all manner of real-world clinical samples remains to be seen. While one of the most exciting claims made of these assay platforms is the minimal sample preparation compared with conventional nucleic acid testing, some form of pre-amplification (e.g., isothermal amplification using RPA) still seems to be required to generate sufficient fluorescent signal for use in a point-of-care setting. Currently, turnaround times of <2 hours are in no way competitive with the <20 minutes claimed by the leading nucleic acid systems. If sample preparation really can be minimized and turnaround time cut down significantly, then the CRISPR tests could replace nucleic acid tests in the future. It’s also worth saying that it took FDA years to come around to the idea that molecular tests could receive a CLIA waiver. Regulatory hurdles will still need to be overcome by Mammoth Biosciences and others before the CRISPR assay format is accepted for widespread use. While CRISPR tests could be a great step forward for point-of-care testing, they still rely on testing against a potential hypothesis (e.g., testing for a particular H7N9 variant when someone exhibits flu-like symptoms). Panel testing plays a useful role when a patient’s symptoms could loosely be described as a respiratory or gastro-intestinal issue, for example. By their very nature, syndromic panels are of course more expensive to run than testing for a single analyte. BioFire’s Filmarray tests and Qiagen’s recent addition, the QIAstat-Dx, are good examples of panels covering a range of bacterial and viral pathogens. CRISPR assays could of course perhaps be run in parallel to form such a panel in the future if there were significant benefit over the nucleic acid tests used currently. However, when a patient presents with symptoms or a specific pathogen that healthcare professionals haven’t seen before, then neither panels nor single analyte CRISPR or nucleic acid tests will find the cause. These technologies offer little benefit when there is no hypothesis to investigate. The WHO maintains a list of priority diseases for which they feel the world is insufficiently prepared. After the second annual review of this “Blueprint” list in February 2018, “Disease X” was added at the bottom of the list. Nobody knows what this disease entails, and that is exactly the point the WHO was making: that there is every chance the next pandemic will come from an unknown source that the world has not encountered before. CRISPR tests won’t be the initial answer to determining what’s causing a pandemic, but other advanced technologies could play a role. “Hypothesis-free” detection requires tools that can fully interrogate a sample and match it exactly, or closely, to a library of references. Should the pathogen be truly novel, referencing against the existing libraries and confirming the pathogen has never been encountered before is still likely to be the quickest route to establishing that a new microorganism has been discovered. The most commonly researched techniques for hypothesis-free testing over the last decade have been mass spectrometry and DNA sequencing. The latter approach has seen far greater interest in the last 2-3 years with a particular focus on metagenomics using next-generation sequencing, an approach that promises pathogen identification from a very broad library of viruses, bacteria, fungi, and parasites. For example, IDbyDNA’s Explify platform claims coverage of >50,000 microorganisms with identification based upon a curated, proprietary library of RNA and DNA sequences. The computational power involved in this sort of diagnostic platform lends itself to a cloud-based (and, therefore, likely a remote) architecture, but the test can’t often be carried out at the point of care. By its very nature, this form of testing assumes access to a next-generation sequencing instrument and therefore there is a cost barrier in addition to logistical/workflow complications at the point of care. DNA sequencing typically requires skilled users to prepare samples effectively, while reagents and test consumables are often refrigerated. Conclusion: What Could This Mean for CRISPR Diagnostics? While any point-of-care tests—whether existing nucleic acid assays or CRISPR diagnostics as discussed in this article—aren’t going to assist in identifying the completely unknown, they will provide some of the solution once the pathogen has been identified. Then with the need for specific tests to be rushed out all over the world, the potential speed of CRISPR assay development, particularly if pre-amplification were not required, might come into its own. These tests would be distributed quickly around the world by air. Unfortunately, this might also be true of respiratory viruses such as Influenza—the very logistics that technology research has helped improve so remarkably in the last 100 years mean that we will encourage a very rapid global spread of the next flu pandemic, 100 years after the Spanish Flu pandemic. Until alternative vaccination methods exist, the information provided by point-of-care diagnostics could play the most significant role in monitoring and containing the next pandemic. Strain-specific tests administered easily and quickly would be a substantial step forward, and it is exciting to consider how CRISPR-based diagnostics could enable this. 1. “Influenza Positive Tests Reported to CDC by Public Health Laboratories, National Summary, 2017-18 Season, week ending Sep 29, 2018” FluView, CDC: https://gis.cdc.gov/grasp/fluview/fluportaldashboard.html [date accessed: February 4, 2019]. Paul Wilkins is managing director of Sagentia’s Medical division. He leads a global team responsible for a varied portfolio of client engagements. With a background in in vitro diagnostic systems, a master’s degree in Mechanical Engineering and Fluid Mechanics from Cambridge University, and more than 10 years at Sagentia, Paul has spent his career working on a variety of product development programs spanning the medical industry.